The availability of embroidery machines and the growing popularity of personalizing and custom designing different sewing projects and gift items have led to more people making the choice to start their own embroidery and/or monogram business. Emerging entrepreneurs take a different approach to their business from operating on a small scale out of their basement to opening a shop and building an expansive customer base. Choosing from one of the 5 top rated commercial embroidery machines is a wise investment in quality equipment. The most important investment any of these business owners will make is in their embroidery machine. Any time the embroidery machine is used for heavy, continuous operation, it needs to be commercial grade. This means that it is built for durability and strength to withstand to high demand without diminishing the quality of embroidery. Commercial embroidery machines may be selected according to a number of available features. Some machines offer greater durability but have fewer convenience features. The five embroidery machines listed below are considered top choices based on their quality and features. The Janome MB-4S has a Remote Computer Screen (RCS) that gives the operator total set-up and editing control. Use up to 65,536 colors. The RCS can also be used to power multiple machines in settings where more than one embroidery machine is used while an on-board sub-control device lets the user work the machine without the controller. Storage is imperative for any embroidery business, and the Janome MB-4S includes a hefty 3 MB for storing as many as 1,500,000 stitches or 100 designs. An LED light provides exceptional visibility of the works space. An automatic thread cutter automatically cuts threads at the end of the project and between letters so operators don’t have to deal with the hassle. The dedicated bobbin winding motor is another time saver that lets the user wind a new bobbin even while the machine is still stitching. The MB-4S uses four needles that allow the user to setup embroidery and let it go to work while they move on to other products. The machine is compatible with industry-standard Tajima hoops and it is designed to work with almost any embroidery formats. The Janome Machine reaches embroidery speeds up to 800 SPM, comes with 50 built-in designs, including 10 monogramming fonts for 2 and 3 letter embroidery. Expanded built-in memory allows users to change colors and implements drag & drop editing of embroidery designs. Designs can be resized by 80% to 120% by rotating in 1 to 90 degree increments. They can also be flipped vertically and horizontally. The features of this machine make it an ideal choice for hat embroidery but the capabilities extend far beyond that. The machine can also be used for embroidery and monogram of all types of clothing, home, and craft items. The Janome MB-4S comes with a bonus package that includes a 3.9” x 2.3” hat hoop, Janome lettering hoop holder unit, no.7, lettering hoop J8, and Janome No. 9 lettering hoop J6. Also included are the metal bobbin and embroidery needles. The buyer will need to contact the seller directly for information on the manufacturer’s warranty. Three-year and four-year protection plans are also available for 30 days after a new machine purchase on Amazon. These plans are fully transferrable if the machine is given as a gift. The Janome MB-4S embroidery machine usually sells for between $8,499 and $9,999 but the best prices can be found at Amazon. The single-head Ricoma EM-1010 uses ten needles and speeds up to 1000 SPM to tackle any embroidery job crafters have quickly and efficiently. The large 7” HD true color LCD touch screen allows for easy stitch and design selection along with visibility of progress during the embroidery progress. The machine boasts a user-friendly control panel and adjusts to multiple languages for easy operation and to accommodate a wide range of users. The EM-1010 includes on-board lettering and has pre-set hoops to avoid hitting the frame. There are 10 built-in fonts and 20 million stitch memory for versatile stitching and design. The machine is capable of reading multiple design formats and it implements on-board lettering. Engage one-step tracing for simplicity while the machine uses low power consumption for greater power efficiency. The Ricoma is made with a servo motor for reliability and durability while remaining lightweight enough for easy handling. . A patented intelligent thread break detection system lets the operator know if there is a problem with stitching to prevent interruption to the design. The machine is USB port-ready, allowing users to download designs from their computer and add them to their collection in the machine’s memory. Connect using Ethernet or wireless connectivity for ease of design management. Editing options include viewing, resizing, or editing designs and watching them progress with a 160° viewing angle. A rotating control arm makes viewing even easier by rotating a full 45° horizontally and 25° vertically. The Ricoma comes with Wilcom Hatch embroidery software, pre-set embroidery hoops, a starter kit which includes bobbins, thread, etc. The EM-1010 comes with a 25-year limited warranty. The Ricoma EM-1010 usually sells for between $9,599 and $9,999 but the lowest prices are found on Amazon. The generous workspace is the primary feature that sets this machine apart. The Janome Horizon Memory Craft has a 15” embossed stainless steel plate in the bed and 11” to the right of the needle, giving it the most workspace of any machine by this popular brand. In addition, the Memory Craft 12000 has the largest, most stable embroidery system the company has ever created. Use the Janome to create and edit designs on the touchscreen or on a computer using HorizonLink™ in real time. Selecting and editing the right design is easy and fast. This is the ultimate machine for sewing, quilting, or embroidery. The machine implements Janome’s new and improved AcuFeed Flex TM system in two widths and multiple feet for even feeding of the fabric and better quality stitching during all projects. Operators can also modify existing stitches or design their own for unique designs. The Memory Craft 12000 has 425 built-in stitches that are fully editable and the option to create unique stitches which can be stored in the memory. Stitch designs also include 10 embroidery fonts and 3 monogram fonts with European letters plus border. There are also Auto Pressure and Auto Height settings that will adjust the settings automatically. The Janome Memory Craft was designed to work as an extension of the sewer’s hands so that it can be forgotten. It is incredibly quiet to operate and provides dependable stitching performance that the user can always count on. Sew at speeds up to 1,000 SPM and at widths up to 9mm wide. The machine also features variable zigzag and has HighLight™ and a magnifier for great visibility. Additional convenient features include the extra-high presser foot lift, 7-piece feed dog with auto drop, auto return after thread break, automatic thread cutter, and built-in needle threader. Janome offers multiple videos on using the Janome Horizon for simpler startup and ongoing creativity of more projects. The Janome Horizon Memory Craft 12000 comes with an extensive accessory pack valued at $700! The AcuFil™ Quilting Kit is available for separate purchase for quilters who want to create the perfect embroidered quilt tops with ease. The Janome 12000 comes with a 25-Year limited warranty when purchased new. Buyers should check the warranty offered on used or refurbished machines. The MSRP for the Janome Memory Craft is $9,999, but buyers can always find the best prices on Amazon. The MB-4N is compatible with six industry-standard Tajima hoops in addition to the four Janome hoops offered. A backlit LCD screen gives operators easy viewing for stitch and design selection and implements multiple languages. The machine is USB memory key compatible and also has a PC card port for transferring and storing designs. 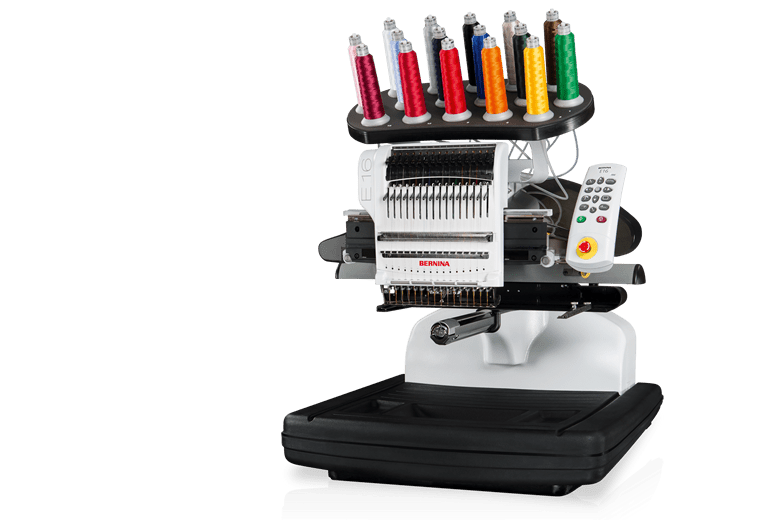 The Janome MB-4N can embroider at speeds of up to 800 SPM for embroidering built-in designs in 50 fonts, 10 monograms, with 2 and 3 letter expanded built-in memory. Drag and drop editing allows the sewer to resize embroidery designs by 80% to 120% and rotate in 1° to 90° increments in clockwise or counter clockwise directions. Designs can also be flipped horizontally or vertically. Hoop M3 (50 x 50), standard accessories such as bobbins, needle, needle threader, large and small felt rings, scissors, seam ripper, thread guide pole, tweezers, lint brush, and a thread guide. The machine comes with a 1-year limited warranty when purchased new. Buyers should check the warranty offered on used or refurbished machines. The MSRP of the Janome 4 Needle machine is $8,499 but buyers can find the lowest prices at Amazon. The E 16 is Bernina’s first multi-needle embroidery machine and it starts off with an impressive 16-needle design. The E 16 is capable of reaching stitching speeds of up to 1,400 SPM. A narrow cylindrical arm makes it easier for embroiderers to get to small places on garments where designs might otherwise be out of reach. The Bernina has automatic tension settings for embroidering different types of fabrics and designs effortlessly. The machine allows users to personalize team uniforms, embroider caps, add monograms to gift or household items, or create a unique tribute in embroidery for any special event. There is even a Chenille technique that creates a 3-Deffect. The Bernina E 16 lets operators complete more of the embroidery designs they love in a shorter period of time. The machine handles more of the design process so they can focus on developing more creative designs. This machine promises to deliver the quality of a true commercial embroidery system. Large projects aren’t a problem for the machine, either. The Bernina implements a unique rotary hook system that is compatible with pre-wound bobbins for greater time-saving. The Go Pro Tension System ensures smooth feeding of thread with the automatic tension adjustment that will result in the same perfect quality of every sewing project. There is also ultraprecise laser alignment that assures accurate placement of each and every design. For larger operations, the Bernina system allows operators to network up to six machines. There is also an extra-large cap embroidery field, and more. The Bernina E 16 comes with 4 standard hoops including the 36 × 30 cm, 44 × 30 cm, 12 cm round, and 15 cm round. Also included are the Go Pro operator’s kit and a design library of 1,000 designs. The coverage on the Bernina depends on the country of purchase and the company from which the buyer makes their purchase. Buyers should register their machines with the company immediately after purchase and follow the recommendations for maintenance in order to receive extended coverage on their machine. The Bernina E 16 runs between $16,499 and $16,999. There are a number of factors that will go into any buyer’s choice for a commercial embroidery machine including the types of items they will embroider and the level of creativity they want to achieve. A good place to start is with a brand name that has a long history of providing quality sewing and/or embroidery machines to meet the needs of a diversity of operators. Those listed here are some of the leading names in the industry.